But not everybody makes getting these clients their first priority. 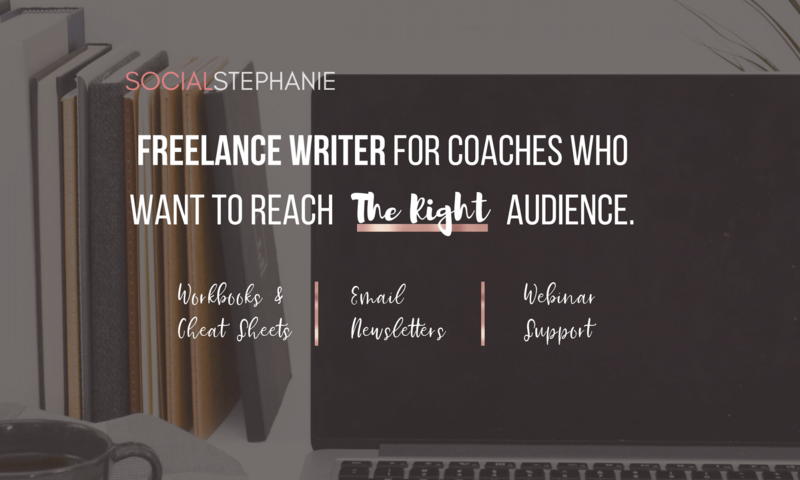 I can’t tell you how many times I’ve talked to coaches and freelancers who wanted to grow their business, but before they even have a steady pool of clients they’re paying out of pocket for a new website and a logo and a bunch of other things that aren’t going to bring them any money in return. Your beautiful website is important, and a logo that communicates your message is a helpful tool to have, but none of these things will get you paying clients. Wouldn’t it be better to have paying clients before you have to dish out money for that expensive website and for a logo designer? There are six steps to getting clients online before you even have a website. These steps are also know as a Sales Funnel, but that sounds so impersonal. What action do you want clients to take with you? Do you want them to book your coaching package or buy your course or sign up for your monthly membership site? The first step to gaining clients online is being clear about what action you want these clients to take. If you’re not sure what the path is, or if you have multiple paths, it’s time to get specific. Sometimes I visit coaches’ websites and I have no idea where to go. They’re offering coaching packages; they’re offering online courses; they’re offering small group coaching. But I don’t know how to identify which is right for me. I’m new to their world. It’s fine to have multiple offerings, but you need to clearly communicate what your MAIN offering is. Imagine these prospective clients standing on a dirt road. Now imagine the road branches off in eight different directions. How does this client know which road to take? It’s your job to make the right choice for them. Put a sign on the road that says “Destination” with an arrow pointing them in the right direction. So if you’re a health coach you might offer meal prep plans and 1-on-1 coaching and a course on vegan living. But you know that your schedule won’t handle many more 1-on-1 clients, so you want to lead people down the online course path. That doesn’t mean you never mention the meal prep plans or the coaching by the way, but your main marketing and promotion, and your sales funnel, will be for your online courses. Now you know what your main offering is, so your next steps are to get them moving in that direction. If you have multiple offerings, pick one to focus on. Being in the opposite situation is also a problem. If you have no main offering for clients yet, it’s time to decide. You don’t have to have this course or package complete before you start getting new clients, but you have to know where you’re taking them. It’s like having a client on that dirt road, but this time it’s a dead end. It’s okay to build the road just a few feet ahead of where the client is currently walking. Then outline what the main package will include. And keep referring to that information for the rest of these steps. It’s very difficult to get people to go on a journey with you if you don’t tell them where the final destination is. So it’s time for you to get clear about your main product or service. You know the client’s future destination, now give them clues that your road is the right way. Break out a small piece of your main service or product as a lead magnet to get new clients. A lead magnet (or an opt-in) is a freebie you offer to potential clients in exchange for their email or other contact info. People join your email list to get your lead magnet. You don’t have to create a lead magnet that’s totally separate from your main course or coaching package. In fact, a lot of coaches run into trouble when they create a lead magnet and then find out that it’s not directly related to the final offering and so it doesn’t lead their potential clients down the right path. Your lead magnet should be a goal post on the way to the final destination. It should attract the right clients and repel the wrong ones. If your monthly membership site is about book marketing for self published authors, but your lead magnet is a fun quiz like “Which Harry Potter Character Are You?” you’ll end up with the email addresses of a bunch of people who love Harry Potter, but don’t care at all about book marketing. Either they won’t buy or, even worse, they will buy and they’ll be unhappy and saddle you with negative reviews. It’s easier to sell a course with no reviews than a course with BAD reviews. The best way to make sure that your lead magnet attracts the right people is to break off a small piece of your main offering — one module of your course or one piece of your coaching package — and use that as your lead magnet. You’ve saved yourself from having to make an entirely new piece of content, and you already know it’s relevant. But where do you put this lead magnet if you don’t have a website yet? Domain name. I buy domain names from Siteground. Siteground is also great for web hosting once your website is up. Later. Email service provider. I use MailerLite as my email service provider, and landing pages are included in the service. Once you buy a domain name, sign up for a MailerLite (or other email provider) account. Then use them to build your landing page. On the landing page, you’ll have a “Click Here” box where people will enter their email address to get your lead magnet, which will be stored somewhere free, like as a Google Doc or in Dropbox. If you want this service done for you, shoot me an email. Time to offer up your lead magnet to your audience. Once you’ve started collecting relevant email addresses, stay in contact with your new subscribers. Let them know that you’ll email them weekly or twice a month with helpful information. Keep these new leads warm by staying in touch with info they’ll enjoy. Don’t go for the big sale right away. Nurture the new leads with an email campaign that let’s them get to know you before you propose. Gain access to other audiences. You may have seen some scary statistics about conversion rates for coaches and consultants. Some people email their list of thousands of people and get an open rate of 10%. Then 10% of the people who opened the email click through to accept the offer. It’s because they’ve built an audience of people who don’t want to hear what they have to say. One of the answers to this is to get more of the right people onto your list. You don’t have to start building a new list from scratch; you can leverage other people’s existing audiences to grow your own audience. When it comes to reaching new followers, nothing moves the needle today like being a guest on podcast. Podcast have very targeted audiences. Certain podcasts are very niche and reach the exact audience you serve. So if your ideal clients are millennial women launching a new creative business, then being a guest on a podcast that speaks to these women will help you grow your list. Pitch these podcasts to be a guest. Let them know what knowledge you can provide specifically to their audience. When you appear as a guest on the podcast, you offer your lead magnet to their listeners. Most podcast hosts would be more than happy to allow you to give away a freebie to their listeners as long as you’ve arranged it beforehand. Sometimes they’ll post your freebie on their own site with a link at the bottom to allow the podcast listener to join your email list. Other times you can give listeners the direct link to your landing page. The smoothest transition from email subscriber to paying client is a webinar. Yes, we spent a couple of steps on the lead magnet, but don’t forget about our actual destination. Getting people on your list is good. But converting them to paying clients is the ultimate goal. Hosting a webinar gives you the opportunity to showcase your knowledge and glowing testimonials, then pitch your larger package to potential clients. Webinars might sound scary, but really they're just a way for you to talk to your potential clients and let them get a feel for your coaching style to see if you're a good match for them. Your webinar should follow up where your lead magnet ended. So if your main offer is a matchmaking service, and your lead magnet is a quiz on how to determine if you’re ready for a relationship, then your webinar could be on how to prepare yourself for a loving, fruitful relationship. Let me put this another way: Your lead magnet should help them identify a problem. Your webinar should let them know what the steps are to take to fix the problem. And your main offering, which was your product or service, should give them the “how-to” instruction to fix the problem. You’re road is built. Take it from dirt road to major highway with automation! Automation. That word sounds scary and like you’ll need some technical knowledge and maybe (gasp!) a website. ClickFunnels is an entire system that helps you automate your lead magnets, email campaigns and webinars into one workflow, or funnel, that functions even when you aren’t working on your business. Well ClickFunnels is the solution to this. You won’t have to manually send out emails or keep track of where individual prospective clients are in the above steps. Here’s a link to get a free 14 day trial of ClickFunnels so you can set up your own steps 1-6 to get your client traffic flowing. I walked you through the non-ClickFunnels process for setting up your lead magnet in Step 2 because it’s the less expensive option. After the 14 day free trial, ClickFunnels starts at $97 per month. Depending on the price of your main offer, it may be an investment worth making. Would 1 new client a month more than pay for the service? It’ll give you more time to do client work and less time building email campaigns and writing webinar scripts. Whether you use ClickFunnels from the start or add in automation down the road, you’ll need a system to keep the sales flowing. Break out a small part of the main product or service into a free lead magnet. Offer the lead magnet to your audience. Gain access to other relevant audiences. Pitch your main offering to your leads in a webinar. Voilà! You’ve got yourself a sales funnel! Don’t worry, I’ve got a free checklist for you that’ll walk you through the new client sales funnel process step-by-step. The Sales Funnels Simplified checklist walks you through the six steps to getting new clients for your business. In 15 minutes you’ll have your sales funnel mapped out, and you’ll know where to go to complete each step. And don’t forget, if you’d like me to do the steps for you, from creating your lead magnet, to sharing it with your audience, to getting you booked as a podcast guest, all you have to do is fill out the form below to set up a free 30 minute call with me. Next PostNext Black Friday Deals for Coaches!